This form is for listing suppliers of live eggs and poultry - not for equipment suppliers. All entries are manually checked prior to display but we accept no responsibility for the accuracy of the information. Entry into the directory is free and at our sole discretion. Low Cost Living - a web site with a large section on keeping poultry. An advert on here will generate enquiries for you BUT you need to think about what you put on it. Please use correct capitalisation - not block caps or all lower case in entries. They look so tacky and won't enhance your image. Badly written entries will not be published. Address: Your postal address. Because of the increasing number of thefts and security concerns, feel free just to put your town in if you wish. Breeds Supplied: Just list names, preferably separated by a comma. No other message in here. Description: Any message you would like people to know i.e. "Please telephone to check stocks prior to calling" Add a little info about yourself and your passion for poultry if you wish. Do try to put something readable, it's what people see! No adverts for other products, thankyou. Email: A working email where we can contact you if we have a query. Please note that your email will not be shown on the site unless you check the "Email Displayed on Site" box. Because published emails can be picked up by spammers, where an email is displayed we use some background code that should prevent spam searchers from picking up the email address. Link to Allotment Garden Poultry: If you are kind enough to link back to us it would be much appreciated. Just pop the page URL you will be linking from in or leave blank if not linking back to us. This is the code we would suggest but feel free to change things to suit your self. 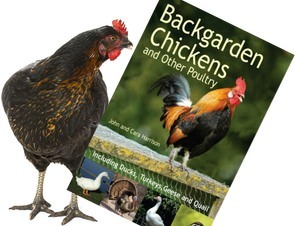 <a href="https://www.chickens.allotment-garden.org/" target="_blank">Allotment Garden Poultry </a> - Help and information on keeping chickens and other poultry at home. Any Message: This is if you want to send a message to us along with this form. It will not be displayed on the site. Magic Word: To stop automatic spam systems you need to put the word chicken in here. Please note acceptance and continued display of entries is at the sole discretion of the Allotment & Gardens Chicken Pages / Low Cost Living. Entries may be edited.